Cakespy aka Jessie Oleson is the author of the popular blog of the same title as her book: Cakespy Presents Sweet Treats for a Sugar-Filled Life. If you have been to her blog you know what sort of desserts she creates: over-the-top, extreme, sugar-filled desserts. I'm not exactly sure how many of these recipes I will try as some of them are so sugar loaded just reading them gives me a tummy ache! But others are going to be hard to resist to try at least once! 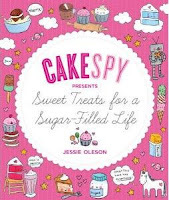 Mini-Baker loves looking through this book as it is filled with lots of Jessie Oleson's own illustrations of Cuppie her cupcake mascot and unicorns. As a fellow artist I probably would have bought this book for the illustrations alone! Oleson also runs a retail gallery in Seattle where she sells her artwork of sweet treats! I loved reading this book and would recommend it to anyone with a ginormous sweet tooth! !